Shortly after our third child was born, we received military orders to move to a new state. It was a heartbreaking move for us because we had been deeply attached to the church and friends we were leaving. Making the move even more difficult was the fact that our precious new baby was not a good nurser, and she never slept. Never. I was exhausted and lonely. When we finally arrived in our new town, I felt very isolated. Our two-year old son was exhibiting classic signs of autism while our newborn was colicky. For thirteen months. I couldn't leave the house without help from my husband or our oldest daughter because I couldn't manage these two difficult babies by myself. The result of this isolation was that I didn't have any friends and sadly, I lived for the days when our son's therapist would come into our home just so I could have some adult interaction. Hello. My name is Pitiful. Days would pass where I didn't want to get out of bed. My husband would come home from work, I would hand off the screaming baby to him and then lay down in sheer exhaustion. But sleep wouldn't come, only tears. And all too soon, he would bring the baby back to me because he couldn't soothe her. Honestly, no one could. It was the most awful year of my life. ​I didn't want to pray. I didn't want to see anyone. ​I felt darkness all around my soul but I knew that it wasn’t from the Lord. He was not the author of the depression enveloping me because his character cannot contain darkness. 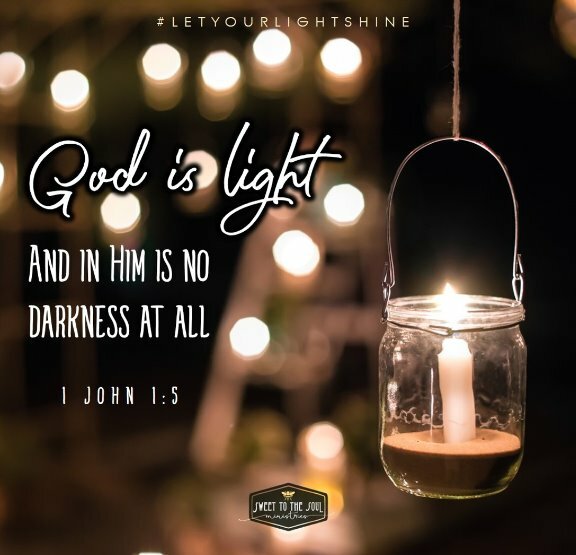 ​Our key verse from 1 John tells us that God is light. And because his character is light, there can be no darkness or decay in him. He is pure and holy, without defect. God is perfect. And he loves us, even though we are broken, defective and imperfect. As I wrestled with feelings of despair and isolation, I began to dive into the scriptures. God reminded me that he has been faithful to me in the past. We need to remember this truth when we are wandering through the darkness. He has already performed many miracles in our lives. Sometimes the Lord will lead us through our own personal wilderness to test us and prove our character. Or will we give up when life gets hard? Let’s make the decision to get up. To take one day at a time. To pray. A lot. And to trust the Holy Spirit to provide us with the stamina and energy and faith to make it through. I didn't suddenly snap out of my depression one day. It was a slow process of learning to trust Christ with my erratic emotions and my depressed feelings. But as I searched for him, I felt his light shine on me. He brought me out of the shadows and into his light. And do you know what I experienced? God’s faithfulness. He loves each of us so much and He wants to see us thriving in Him. 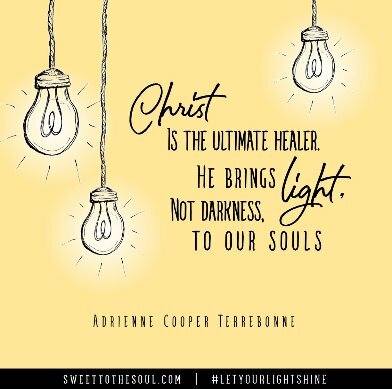 ​Christ is the ultimate healer. He brings light, not darkness, to our souls. He is mighty to save, friends. Pour your heart out to Him. Trust Him to lead you in the appropriate direction. He wants you to be healed and whole. ​Father, we thank you for your light when our world feels dark. Help us to seek after you. Remind us of the many miracles you have performed in our lives already and help us to be faithful in following where you lead. We love you and we want to strive to pursuing you in holiness. In Jesus name, Amen. I have been pulling inward lately and not feeling very social. Days feel long and hard, so I thank you for these words. God will bring me back to the light if I keep seeking Him! Yes, He will, Sarah. It is very easy to withdraw when we are in a hard season, but keep seeking Christ. I am lifting you in prayer today! It's so easy to fall into the 'pitiful me' pit. I've spent some time there myself :). I'm glad your babies grew out of their problems and that you found hope in Jesus. I think a lot of us have probably spent some time in that pit. Thank you for the encouraging words, Anita!